Topics Include: [2:30] Week In Review [6:00] The Wild are not a good team at home. Why? [13:10] Examining the Wild and Coyotes remaining schedule. 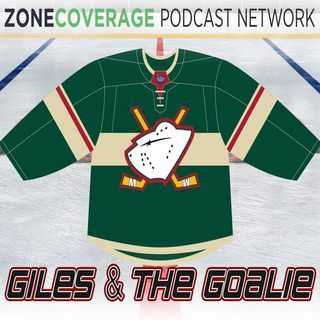 [28:24] Bruce Boudreau Quote of the week [31:02] Kirill Watch [33:18] Central Intelligence [35:56] Top 10 Current NHL Jerseys A Zone Coverage Podcast Network Production Follow the Crew on Twitter: @BenRemington | @gilesferrell | @GatGWildPodcast Follow Zone Coverage: @ZoneCoverageMN Listen to the show ... See More on Libsyn, iTunes, Stitcher, SoundCloud, Google Play, iHeart Radio, and YouTube. Follow us on Facebook, Twitter, and Instagram.